An artist's rendition of an asteroid impacting the Earth. New researcher examines how quickly life recovered following an asteroid impact on Earth about 66 million years ago. THE WOODLANDS, Texas – Life came back surprisingly quickly to the site of the impact that killed the dinosaurs, new research found. When a 6-mile (10 kilometers) asteroid slammed into the Gulf of Mexico 66 million years ago, causing the demise of the dinosaurs as part of the largest mass extinction event in the last 100 million years, it took life on the planet at least 30,000 years to bounce back. The space rock also melted the crust and mantle at the point of impact, making modern scientists suspect that life would have had a particularly challenging time recovering at that location. "Life returned to the crater very quickly," Christopher Lowery, a researcher at the University of Texas-Austin, said during a news conference at the Lunar and Planetary Sciences Conference (LPSC) here in Houston on Tuesday, March 21. Microfossils found in the core sample show that life at the crater reappeared after about 30,000 years, roughly when it reappeared in other locations, according to Lowery. "You see [that resurgence] across the globe," Lowery said. Beneath the tropical Gulf of Mexico, near the Yucatan Peninsula, lurks the crater known as Chicxulub. This indent in the Earth is the tombstone of the rock most famous for killing off the dinosaurs. The asteroid impact also triggered acid rain and forest fires around the globe, and blasted sulfur and other rock into the air in quantities large enough to block the sun. The collision vaporized the kamikaze asteroid and put a significant dent in the number of species alive on Earth. It also scattered the dust around the world to create what scientists call the K-T boundary, a layer that includes bits of the asteroid itself sandwiched between the rock layers that formed before and after. However, these traces of the asteroid alone weren't convincing enough to attribute the extinction to the space rock's collision with Earth. Then, in the late 1970s, geophysicists searching for petroleum found the 110-mile-wide (180 km) crater beneath the ocean. It took more than a decade to find a substantial link between that crater and the mass extinction that killed the dinosaurs. In 2016, a team of scientists headed to the gulf to take a core sample from the crater rim. Drilling into the ocean floor from a ship on the surface, they excavated a half-mile-long (800 meters), pillar-like core that revealed the geologic history of the region. The task required specialized drilling equpiment, but the challenge paid off: The underwater location managed to preserve the crater far more than happens with land-based craters. Its subsurface placement makes Chicxulub "the most well-preserved crater" known to date, said David Kring, an impact petrologist on the excavation team who has studied the crater for decades. The extinction event at the end of the Mesozoic era caused by the asteroid is the only such event to have occurred suddenly, thanks to its external origin. According to Lowery, other massive extinctions occurred gradually, caused by volcanic events and climate change. Under those circumstances, other life-forms filled the niches cleared by their doomed neighbors. But when the asteroid slammed into the Earth, it almost immediately created a 150-km-wide (90 miles) sterile region where no life could survive. Measurements of the seafloor taken in the 1970s revealed this dead zone, Lowery said, though its source was then unknown. "Life was totally obliterated by the impact," he said. 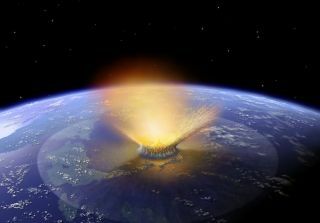 Because of the different processes involved in the sudden impact extinction event compared to other, more gradual extinctions, scientists were unable to make strong estimates on how quickly life would re-emerge at the impact site, Lowery said. But the layered core could reveal when microfossils first began to reappear. After the core was retrieved, Lowery began the painstaking search for two kinds of microfossils. The first, planktonic Foraminifera ("forams" for short), are tiny, sand-grain-size life-forms; they are the primary focus of Lowery's research. The second, much smaller, calcareous nannoplankton photosynthesizes and can shut down completely for extended periods under adverse conditions. After examining the core, Lowery concluded that the nannoplankton in the region spent 5 million years after the impact in what he called "disaster mode," blooming again once conditions were favorable. The forams recovered much faster, rapidly spreading after the cataclysm, Lowery said, bringing life back to the crater. "There's life on the seafloor within 30,000 years of the impact," Lowery said during a presentation at the LPSC meeting. Where that life came from is still unknown, however, he said. It could have crawled back from the newly formed hydrothermal vents created by the impact, or it could have washed in from another part of the ocean, Lowery said. Why the nannoplankton took longer to re-emerge than the forams remains an open question, and one the team hopes to answer with further analysis of the core, Lowery said. Follow Nola Taylor Redd on Twitter @NolaTRedd,Facebookor Google+. Follow us at @Spacedotcom, Facebookor Google+. Originally published on Space.com.